Amazon does deals of the day that are often easily ignored. Today’s deal, is not one of those deals. 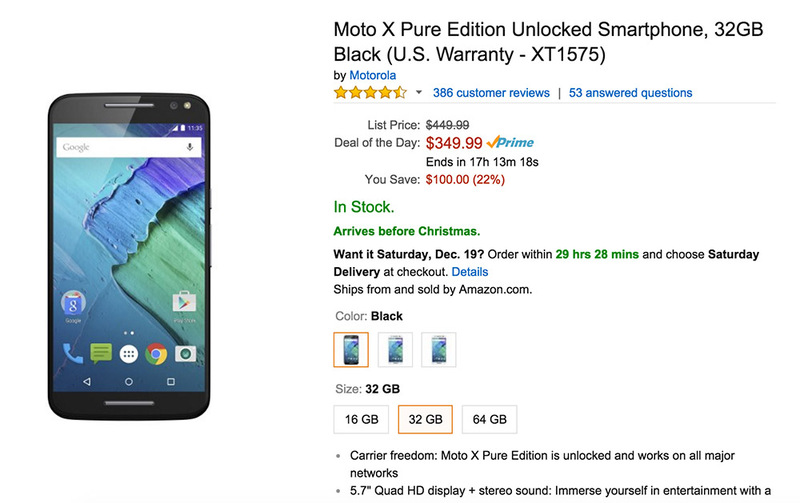 For today only, Amazon has slashed $100 off the Moto X Pure Edition with 32GB of storage, dropping it down to $349. For $349, you get a phone that is easily in the top 3 of 2015. Just a month ago, we called it one of the 3 best phones you can buy today. We also gave you 5 reasons to buy the Moto X Pure Edition a couple of weeks ago as well, in case you were still hesitating. Oh, our Moto X Pure review is worth a look too. The black or white standard models with 32GB storage at $349 (down from $449). The white and bamboo model is $375.